Rev up your Saturday this week at Kasha Ki Aasha with ZCK! 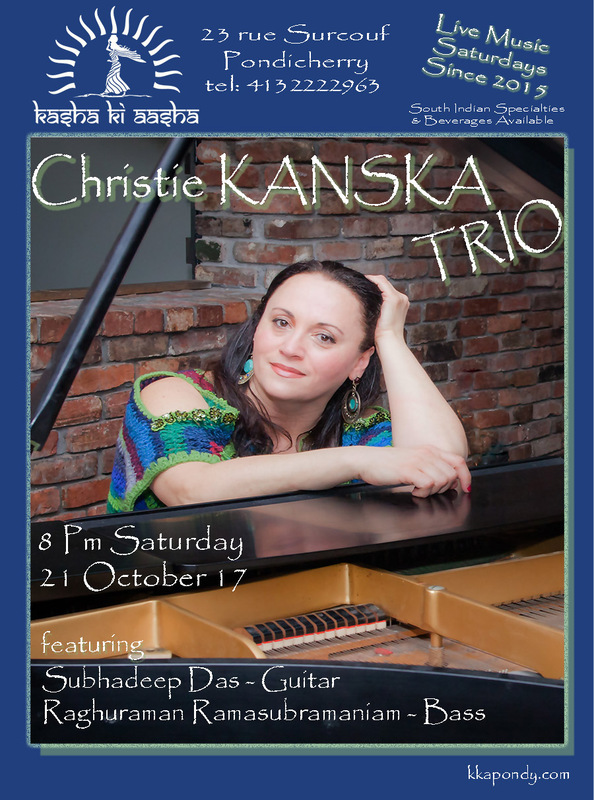 Kasha Ki Aasha holds an evening of music by the reknowned vocalist & pianist Christie Kanska and her husband Zdenek Kansky, a musical artist. ‘ZCK Music Production’ was founded by the duo in 2014. Christie has performed as a vocal soloist with various classical, modern and jazz bands and orchestras across Europe and the eastern USA. Christie captures her audience with her honesty and artistic mastery. She expresses her love for people, nature, and life through original music and poetic lyrics. The show starts at 8 pm at Kasha Ki Aasha located at 23, Surcouf Street, Pondicherry. The terrace garden also offers a mouthwatering homemade South Indian menu to make your evening more special. For directions and reservations, call 0433 2222963. 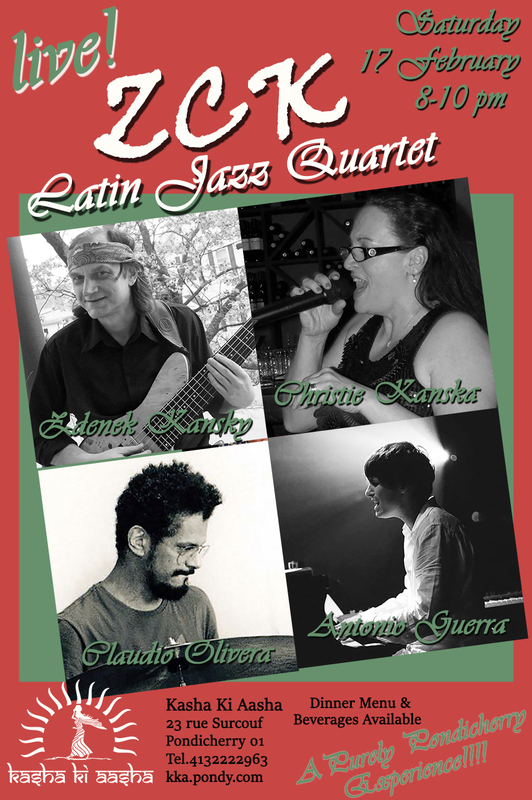 Kasha Ki Aasha is proud to continue its Purely Pondicherry Performance Series with the first Indian appearance of the ZCK Latin Jazz Quartet this Saturday evening at 8 pm. The quartet featuring Greek vocalist, Christie Kanska, Czech Bassist, Zdenek Kansky and Brazilians – pianist, Antonio Guerra, and percussionist, Claudio Olveira come together for the first time in public on our breezy garden terrace this weekend. The music starts promptly at 8 pm and you are welcome to make reservations by calling 413 222 2963 or just coming by Kasha Ki Aasha directly 23 rue Surcouf, Pondicherry 605001. Would you like to know more about the performers? Check out Christie Kanska HERE! For more information on Zdenek Kansky click HERE! Discover Antonio Guerra on his WEBSITE! Claudio Oliveira can be heard right HERE! 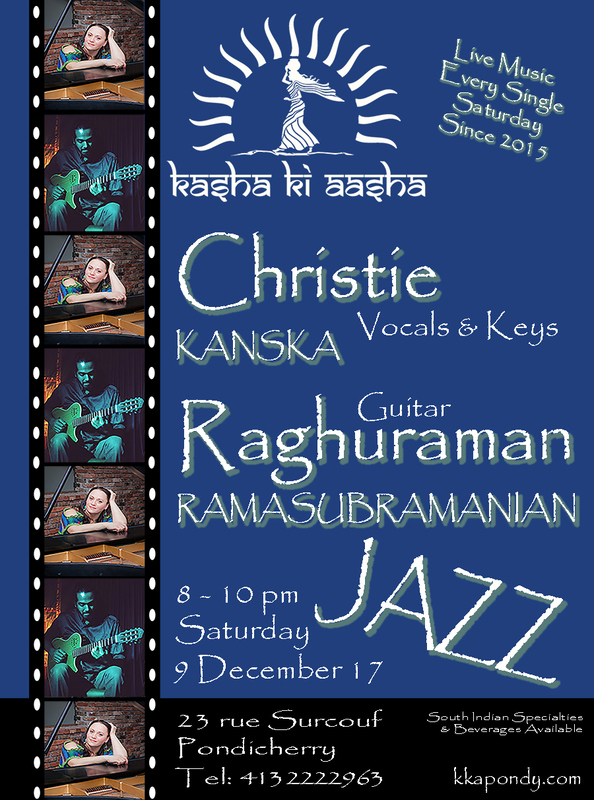 Kasha Ki Aasha welcomes back JAZZ vocalist Christie Kanska this weekend. Christie will be also playing keyboard and performing with our original musical friends, Raghuraman Ramasubramanian on guitar. This duo was a great hit in their first performance so make you sure you make it this Saturday at 8 pm. There will be a special, surprise “performance” created in conjunction with the jazz this weekend so come check it out! As always our home style dinner specials will be coming fresh out of the kitchen. Call for reservations at 413 222 2963. Kasha Ki Aasha is just around the corner from the French Quarter at 23 rue Surcouf, Pondy 01. This Saturday evening we welcome the Christie Kanska Trio to our terrace. Christie’s internationally renowned keyboard and vocal talents will be backed by Subhadeep Das on guitar and our dear friend Raghuraman Ramasubramaniam on bass. Look forward to an entirely new sound this evening as Christie brings her Greek and Armenian heritage to the stage with arrangements of Komitas, Greek folk songs with odd meters as well some of her own original compositions and favorite Latin Jazz songs. Music starts at 8 pm and as always we have the best of South Indian Vegetarian Cuisine made just for you with Chef Elisa’s special pizzas hot out of the oven! Beverages are also available! Kasha Ki Aasha is just a hop, skip and a jump over the canal away from the French Quarter at 23 rue Surcouf! Looking forward to sharing another Purely Pondicherry Performance with you this Saturday!